Digested the McLaren Speedtail, have you? Good. 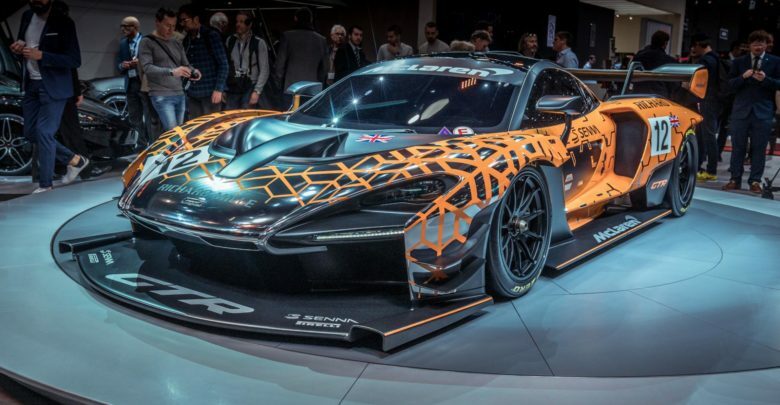 Because McLaren’s now busying itself turning the Senna GTR track-only special from a Geneva show ‘concept’ into a finished item. A fast one. To mark the start of the car’s dynamic testing, Woking has confirmed big numbers for the Senna GTR. The headline is downforce: 1,000kg of it, though the speed at which you have a tonne of aerodynamic grip available isn’t disclosed. Not that the Senna GTR will want for speed: its 4.0-litre bi-turbo V8 will develop 607kW – up from 588kW in the road-going Senna. Torque output remains 800Nm. Ridiculous downforce comes courtesy of the Senna GTR shunning road-legality, and employing active aero banned in the top echelons of motorsport. This sketch shows what to expect from the ‘production’ car – McLaren notes there’s a wider track, wider fenders, a ginormous front splitter (our word, not theirs) and a moveable rear wing ‘coupled’ to the rear diffuser. We’ve also been given more clues about the Senna GTR’s light-weighting inside. No airbags, no infotainment touchscreen, no folding instrument binnacle – the only concession to comfort is air-conditioning. McLaren’s also included an interesting sounding ‘radar-assisted rear collision avoidance system’, which presumably boosts the car forward if its bonkers braking performance catches out an over-keen track-day goer behind. Or, perhaps it has missiles. Though there’s no official weight for the Senna GTR yet, McLaren has promised it’ll be lighter than the 1,198kg road-legal Senna. It’ll also cost £1.1m (R20 mil) plus local taxes, but the 75 slated to be made are all sold, to brave individuals who desire a car with GT3-spec racing suspension, slick tyres and 3g capability. That’s 3g as in cornering G-force, not on-board internet. So, this thing’s going to be very much the antithesis to the slippery, equally sold-out Speedtail, then.Got a favourite?